Our topic for February is what we call Dimensions of Gaming. These are three subtopics used to collectively categorize the intended audience for a game. This month we will cover Scalability, which is how well a game plays over the entire range of its suggested player counts. We will also cover Game Length, which is the expected duration of a game and how game design can maximize the experience of the players by using this time effectively. This week we are examining Complexity, which can be defined as the cognitive burden expected of players over the course of a game. The span of Complexity encompasses the entirety of a game from rules to mechanics and layout to player decision trees. 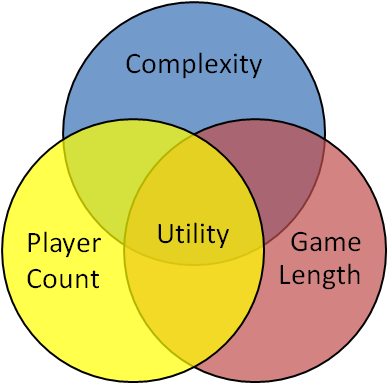 The key areas of complexity in game design is striving for a high depth to complexity ratio and the playing value created through emergent gameplay. The level of complexity in a game can be evaluated using several methods. The first is by using game weight, a subject Matt covered in December. The method most relevant to game design is by comparing the complexity of a game to its strategic depth. Strategic depth is the advanced strategy and intricacies presented to players as they gain experience and progress through the learning curve of a game. Of the three pieces of information that grace the sides of every board game box (the length of the game, the age range, and the number of players), the first two are approximations that can be determined by the publisher and/or the designer during playtesting or post-production, but the number of players is explicit in the design. The dimension of gaming we’ll talk about this week is player count, the use of different player numbers as a mechanic or design decision. We’ll also talk about scalability, the ability of games to scale to accommodate different numbers or configurations of players. As I talked about in an introductory post back in December, one of the many ways to classify games is by the number of players. Player number is a deliberate design choice with implications for strategic depth, length, pacing, and complexity. This month we have been exploring Dimensions of Gaming, which are criteria such as player count and game complexity frequently used before a purchase to determine if a game is right for you. This week we are looking at game length, the time commitment needed in order to reach completion. Games are frequently categorized by their length. Short games are sometimes considered fillers and sandwiched between two longer and more immersive games. Every game carries with it an expectation as game designers have a responsibility to maximize the experience of their players. This includes prioritizing an investment with true value: a player’s time. Game design should focus less on the duration of a game and more on how much a person gains from playing it, better described as time value. All things considered, if a game can deliver the same experience in a shorter amount of time it will be played more often, receive more attention and garner greater commercial success. Throughout this month we have been exploring Dimensions of Games: Complexity, Player Count and Game Length. These are three criteria commonly listed on the side of a game box whose impact blends together to create game Utility. Utility is defined as the usefulness of something, the ability of a product or service to satisfy needs or wants. For the purposes in this article, utility is simply a compound of game design elements which help to define how and when a game can best be played. Players acquire games for a purpose and maximizing the opportunity to play them can be a beneficial design goal. 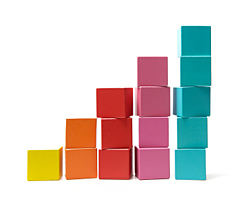 Games can increase utility through a reduction of complexity. Gateway games increase utility effectively by providing a welcoming environment to newcomers in the hobby. Games such as Settlers of Catan and Carcassonne introduce a whole new world of gaming to a wide audience with just a few rules that build on familiar game concepts. Games with low complexity have a high utility as they can be brought to a table full of gamers and non-gamers alike. We’ve got some extra-special topics on deck this month but first a quick re-introduction to where we left off. Earlier this year we introduced the first phase of our framework we call “dimensions of games”. Our initial three attributes you’re probably familiar with as they contribute to the label on the side of every game box: Complexity, Player Count and Game Length. We concluded with the concept of Utility which is how the aforementioned attributes combine to form the situational value of a game. Naturally some games are easier to get to the table as they are easier to explain to a new group, can fit into a limited time frame or accommodate a wide number of player counts. Complexity, Player Count and Game Length each allow a game designer control over the intended experience. A designer may start with a design goal of a game that scales well between two and six players or packs a lot of interesting elements into a one hour playing time. This week’s dimension of gaming is Downtime. We’ll define downtime simply as the portion of the game for which you’re not actively playing. Downtime can happen during other players’ turns, during setup or cleanup, or during intermediate steps of a game like dealing cards for a new round. This dimension of gaming exists at the intersection of Game Length and Player Count: longer games increase the risk of downtime because as the length of a game increases, the length of time a given player is not doing anything increases. And as games are scaled up to include more players, designers need to keep in mind not only how the mechanics balance but also how adding more players affects the player experience, especially as it relates to taking a longer time before any individual player gets to take his next action. Downtime is a great opportunity to discuss the paradox of choice, which plays out in the context of game design as analysis paralysis. When presented with multiple options, game theory suggests that a person, as a rational actor, will make the optimal choice. Given the choice between a hot dog and a hamburger at a cookout, a person who really loves hamburgers will pick the hamburger almost every time. With more options, it seems reasonable that a decision-maker could be even happier: suppose someone else at the cookout leaned slightly toward the hot dog camp but wasn’t crazy about either option. The addition of grilled chicken as a third choice would allow that person to optimize the decision he had to make.